In Apple’s quest to simplify the Mac user experience, they hid the windows status bar in Mac OS X starting with Lion and continuing through with Mountain Lion, Mavericks, OS X Yosemite, El Capitan, and Sierra. Obviously that change is here for good, and while this definitely makes for a cleaner appearance when looking at folders on the Mac, if you actually like to know how much disk space you have available at a quick glance, it’s kind of annoying. 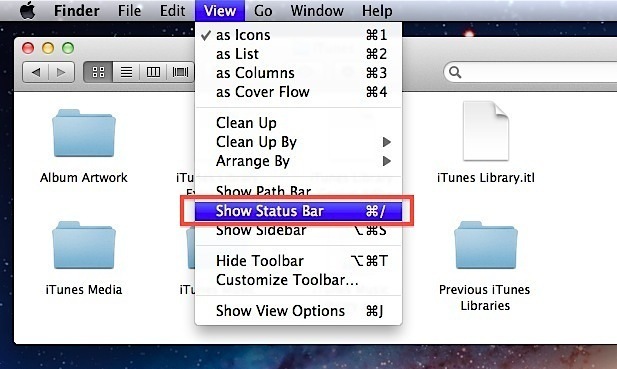 Fortunately, if you want to see those status details of any Finder windows, including the disk space and file counts of an active folder or directory, you can change the status bar visibility and make the available space indicator visible again. This is extremely easy and just a quick toggle adjustment away. Or you can toggle the Finder status bar on or off by using a command keystroke, simply by hitting Command+/ – this will either show or hide the status bar depending on what is currently set. If you decide you don’t want to have the status bar visible in Finder windows again, simply hit the command keystroke again to disable it, or deselect it from the View menu so that it’s hidden again. thumbs up! i was bummed when they removed it and hadn’t realized they added the option until i read this post. thanks for the info. Bless you! This was driving me crazy! Lion almost drove me mad. thnx mate. it’s crazy not to have these things visible by default. Whew! I was going nuts. I wish the updates were more clear about changes made and how to find what you’re looking for. I’m grateful for the help! Nice disc scan utility is Nektony Disk Inspector. It scans any supported drive and generates a chart representing the file system usage. Thank you! I asked the people at the apple store and they didn’t know how to enable this information on the window. I searched the Mac AppStore and found an app called Freespace. 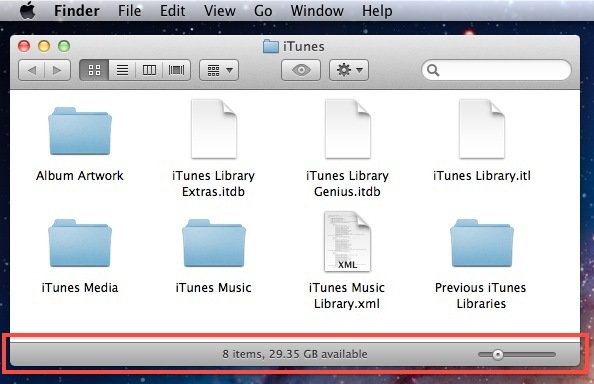 It displays all drives’ available space in the menu bar. I can also eject all my USB drives with single click. Thank you so much !!!!!!!!!!!!!!!! Yes! I was kinda pissed when I upgraded and thought they had completely removed this feature, thank you! Thank You. These new OS versions seem to hide more useful features than they add…. They add launchpad (useless) and eliminate critical data on file/disk usage. Thanks SO much! Missed that info so much when I recently jumped to Mtn Lion until finally googled and found your article. Thank You very much for this. It works great. Why Apple keeps removing features makes no sense. They did the same thing with “Spaces”. It worked much better than mission control. Apple keeps removing all the good things about OS X…..